(West) The walk starts on the connection from Tamarack Park to the W&OD Trail. This can be accessed by a trail at the southern end of Horseback Trail that enters Tamarack Park. Stay on the entry trail as it curves to the right. It ends at the W&OD Trail. Turn right to go west on the W&OD horse trail. (East) The walk ends at the connection to Tamarack Park. A sign on the left of the W&OD horse trail marks the entrance to the park. The Cross County Trail turns left to enter that park. Go straight on the trail through the park to reach Horseback Trail, the nearest access point by car. (West) The horse trail crosses the W&OD bicycle trail. Continue on the horse trail if you wish to avoid the bicycles on the bicycle trail. (East) The horse trail crosses the W&OD bicycle trail. Take the horse trail as the Tamarack Park entrance sign cannot be seen from the bicycle trail. (West) The horse trail crosses the W&OD bicycle trail again. Continue on the horse trail if you wish to avoid the bicycles on the bicycle trail. (East) The horse trail crosses the W&OD bicycle trail. Continue on the horse trail if you wish to avoid the bicycles on the bicycle trail. 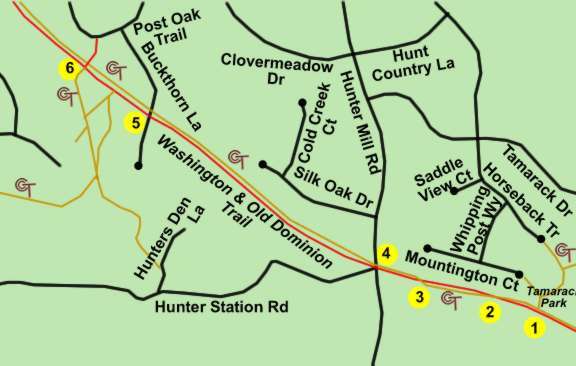 (West) The trail crosses Hunter Mill Road. Stay to the right to continue on the horse trail on the other side. The horse trail is shadier than the bicycle trail in the next section. (East) The trail crosses Hunter Mill Road. Stay to the left to continue on the horse trail. (West) The trail climbs a hill to cross Buckthorn Lane. Continue on the horse trail. (East) The trail climbs a hill to cross Buckthorn Lane. Continue on the horse trail. The horse trail is shadier than the bicycle trail in the next section. (West) An asphalt trail intersects with the W&OD trail. The Cross County Trail continues on the path to the left. This ends the walk on the W&OD Trail section. The asphalt trail to the right leads to Post Oak Trail near Buckthorn Lane. (East) The walk starts at the junction of the Twin Branches Trail and the W&OD Trail. The nearest access point by car is a short asphalt path intersecting with Post Oak Trail just south of Buckthorn Lane. Once at the W&OD horse trail take that trail east.